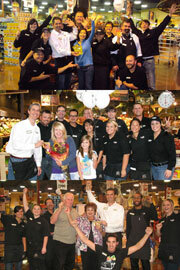 $1,000 Nugget Markets Gift Card Winners! Buy one package of Sargento Cheese Dippers (with pretzels or sticks) and get one free! Spooky, scary and totally delicious! Pick up one of our bakery’s Spider Web Cakes for your Halloween party — available in vanilla or chocolate with butter cream icing. Congrats to Stanley Dodson of West Sacramento, Joanne Shi of Davis, and Cyndee Donovan of Vacaville! They each won a $1,000 Nugget Markets gift card for entering our Anniversary Drawing. Thanks to all who entered the drawing and joined in celebrating our 84th anniversary. Up for a wine/beer tasting this Friday? Come to the following Nugget Markets locations, 5 p.m. – 7 p.m.
Nugget Market gets scary (not really!) and supports the Sacramento Zoo’s Boo at the Zoo (4:30 p.m. – 8 p.m.), a fun, not-too-scary adventure for trick-or-treaters. Kids can safely trick-or-treat around the lake at different candy stations, while also enjoying magic shows, crafts, and lots of family fun. Stop by the Nugget Markets booth on Saturday for some fun treats! For more information, please call 916-808-5888 or visit www.saczoo.com. Prices valid 10/27/10 – 11/2/10. This year let Nugget Markets help make your Halloween party a fun, frightful “foodie” food-fest. 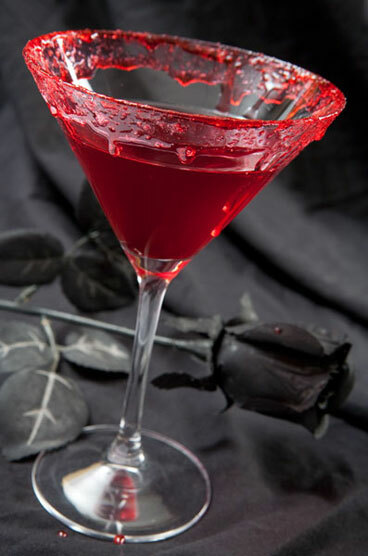 This martini is sure to please vampires and mortals alike! Sweet raspberry flavors mix with vodka for a festive drink in a candy-rimmed glass. Absolut Vodka is on sale this week for $15.99, save up to $9. (750 ml. bottle). This drink is a must-have for any Halloween bash. 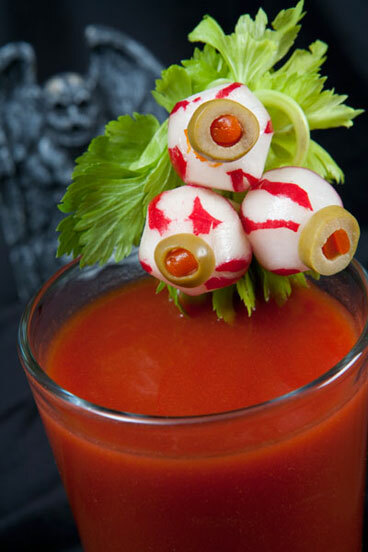 Add a fun twist with radish and olive eyeball garnish. Sobleski Vodka on sale this week for $13.99, save $8! (1.75 liter bottle). Halloween is more than just one day of trick-or-treating. Parties abound this time of year, and if you start adding up how much sugar your kids (or you) might be eating with all the cupcakes, cookies and sugary drinks that are available at these festive gatherings, it might make your teeth hurt! This Halloween, throw a fun party with these spooky (but healthy) treats. 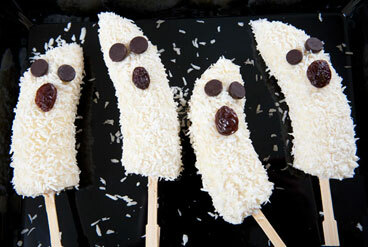 Turn a banana into a frightful ghost! Cut the banana in half widthwise and insert a popsicle stick into the flat end. Freeze for a few hours, then dip in orange juice (Florida’s Natural Orange Juice (59-64 oz. carton) is on sale for 2/$6 this week), followed by shredded coconut. Be sure to grab the dried shredded coconut. We found that moist coconut flakes did not stick to the banana well. Place two chocolate chips for eyes and a plump raisin for the mouth. 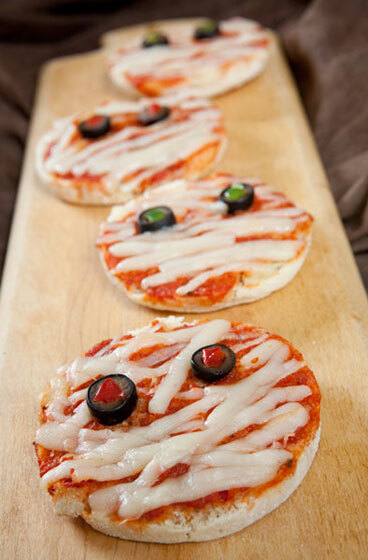 Make a mummy face on an English muffin (Oroweat English Muffins (6 count package) are on sale at $2.99 this week). Start by splitting the English muffin in half. Then toast and spread a tablespoon of pizza sauce on the cut side. Add two olive slices for eyes and a bit of red or green pepper for the pupils. Lay string cheese strips across (mummy “wrappings”), leaving the eyes peering through. Bake at 350° until the cheese bubbles, about 10 minutes.